Before taking their seats at The Bunker, audience members are asked by the play’s co-lead, Lara Sawalha, to hand over their shoes. Surprisingly, most do. 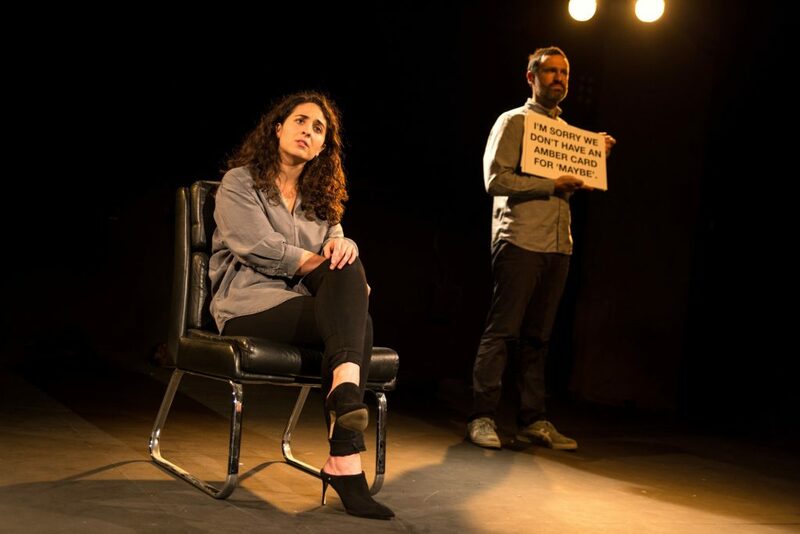 Once the audience is settled with their shoes lined up on stage, Sawalha and Ben Nathan, her co-performer and the play’s creator, begin the first interchange of verbatim testimonies taken from Israeli and Palestinian farmers, students, professionals and ex-combatants. These views reach an antagonistic climax, then the lights are back up and Nathan explains the development of Semites, a project triggered by a heated, anti-Israel audience Q&A he had experienced in 2011, which led to him questioning his natural loyalty to Israel as a British Jew and organising a tour of the territories. The performance then resumes with a challenge to the audience; a show of hands tests our knowledge of our neighbours and how often we mingle with those of opposing views, before the lights go down and the testimonies continue with Sawalha presenting the words of Palestinians, Nathan, those of Jewish respondents. These three strands, verbatim theatre, audience participation and the actors’ personal accounts, interweave across the hour. Lighting demarcates the changes and our shoes are brought into play in pools of light to create immediacy and empathy with those whose stories are told. Sawalha’s characterisations are particularly good, while Nathan’s candid telling of his personal journey drives the narrative. The sound department backs them both with ambient sounds of cafes and roads to great effect. The stories are occasionally searing. An Israeli soldier describes with chilling detachment how he watched a Palestinian father beat up his son to protect him from a worse fate at the soldier’s hands. But some methodologies are not so illuminating. Being asked to shut your eyes during a show of hands is a pretty empty experience. A sketch in which the actors imagine a dividing wall in Yorkshire is borderline patronising. Preceding this with a running joke apologising in advance for the Northern accents is cute but punctures the mood so close to genuine testimony of horrific experiences. So, by the far the most successful part of the show is the oral history – informative, engaging and we could have done with more. Nathan spoke with only 45 people around Hebron and Biet Jala, suggesting a lack of reach and resources may have played a part in the evening’s reliance on theatrics, and this dilution undermines his good intentions. Though actors and creative team deserve credit for an interesting idea and some powerful moments, the outcome is occasionally gauche. In one of the last audience participations, we’re asked to display support for lines of testimony by holding up cards, a notion out of keeping with the non-judgemental concept. Thankfully, most don’t.